Create your own Business Cards. Create your Own Business Cards is one piece of the Create your Own collection of applications. This collection is created with the intention of empower its users allowing them to do things by themselves for which they usually needed third-party assistance. It gives them independence and can save them a lot of dollars, that’s for sure. In this case, this tool will help users to create their own Business Cards. 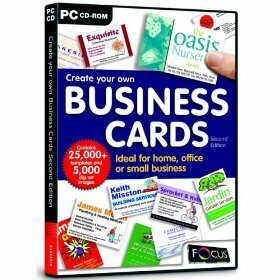 Containing over 25,000 templates covering a wide range of business types plus 5,000 clip art images, this program contains all of the tools needed to create professional looking business cards in minutes, saving you both time and money. 1. Create: Select a ready-to-use clip art, or one of your own. 2. Customize: Add your own freehand designs, images, logos or photos. 3. Print: Print your finished business cards as and when you need them. # Digital camera compatible - add your own photos and scanned images. # Step-by-step wizard to help you lay out your business card. # Includes vertical, horizontal and folded card designs. # Add graphic objects to your design - including logos, frames, shapes, effects and Text Art. # Import various file formats including BMP, PSD, PNG, PCX, WMF, TIFF, TGA, and JPEG. # A “Quick Edit” function to get your images to look their best. Functions include Exposure, Resize, Rotate, Sharpness, Colour, Red-Eye and Scratches. # Save as JPG option for email attachments. # Handy hints and tips.